Oh, Blizzard. Over the past two decades, no company has consistently gotten me hooked on video games the way you have. Just how do you do it? Yesterday I picked up Hearthstone, the free-to-play card game set in the Warcraft universe, which came out for iPad earlier this month. Blizzard first released Hearthstone for PC, but something about playing this kind of game on a tablet just feels nicer—the touchscreen works perfectly for sliding tiles and selecting creatures, and the portability makes it easier to play whenever I have a few spare minutes at home. I started playing yesterday afternoon. I can't figure out how to stop. 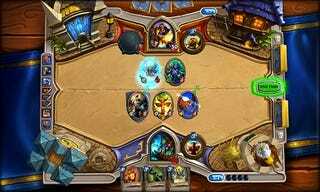 Hearthstone, unlike many collectible card games, is super-streamlined. It's a simple game, easy to pick up and jump into. The concept is as straightforward as these things get: use creatures and magic spells to slaughter your opponent before they can kill you. The closest comparison is probably Magic: The Gathering, though Blizzard has wisely stripped out Magic's resources—lands—in favor of a simpler gem system that gives you the opportunity to make at least one move every turn. This trades a little depth for quicker matches, and it's nice to have a multiplayer game that you know you can finish within 15 minutes. And where Magic has colors, Hearthstone has heroes: you can play as one of nine different Warcraft-themed classes, like mage or druid, each of which comes with its own special ability and cards. I haven't spent enough time with the game to really master the nuances of these classes, but I can conclusively say that playing as a mage owns. In other words, this is the CCG that casual players have been craving for years. Also, I haven't spent a dime. I can't imagine ever sinking my life into Hearthstone like I once did to World of Warcraft many years ago, but I can totally imagine picking up the iPad every day or two for a couple of quick matches. There's nothing like that endorphin rush you get when you take down an enemy player. And there's really nothing like losing to a friend and immediately promising to take your revenge.